Check this feature off in the very helpful, but wish I would have discovered it sooner category. Perhaps you were searching for how to turn your battery percentage on in your iPad status bar and were lucky enough to stumble across it sooner than me. No matter how you might, or might not have gotten there, knowing how you spend your valuable iPad battery charge can be very empowering. To navigate to the battery settings go to Settings–>Battery. Not only can you monitor your battery usage over the last 24 hours, but you can also see a snapshot of what your activity level was over the last 7 days, and the proportion of the battery used by each app you interacted with. In addition, by selecting the clock icon to the far right of the battery usage menu you can view the actual amount of on screen hours the app was active as well as the amount of time each app was running in the background. I found the latter piece of this information to be an eye opener, because I had no idea how long some of my apps were running after I closed them down, and went on to other tasks. On my iPhone, for instance, Facebook was, by far, the worst culprit. I check Facebook on and off all day, but I typically don’t spend a lot of time with the app open. However, when I opened the Battery settings I was alarmed to discover that I had the Facebook app open 10.2 hours in the last week. Worse still, was the fact that it had been running an additional 4.9 hours in the background! I never would have discovered this had I not known about the battery usage feature in iOS 9. 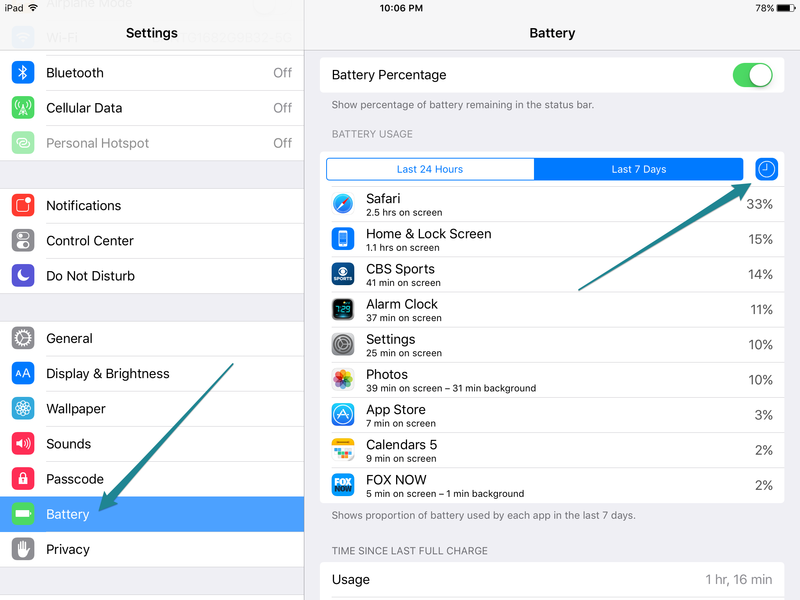 It’s definitely worth a look, and I highly recommend you spending a few minutes learning about you usage habits and how you may be able to minimize the battery drain on your iPad.